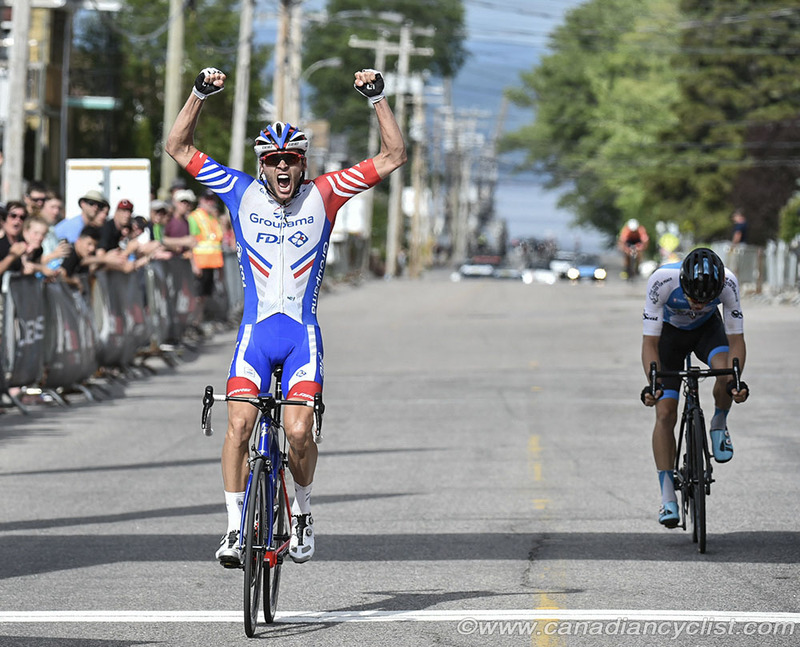 The road race competition at the 2018 Global Relay Canadian Road Championships p/b Quebecor concluded on Saturday with the Elite and Under-23 titles for men and women awarded. First time champions Katherine Maine (Rally Cycling) and Antoine Duchesne (Groupama FDJ) won the Elite titles. Athletes faced a tough 15 kilometre circuit in and around the town of La Baie. Each lap included a steep one kilometre climb that proved to be the deciding factor in many of the races. The women raced 120 kilometres and the men 181 kilometres. Each race became one of attrition, with the fields gradually being whittled down every lap on the long climb. In the women's race, Maine was part of an early breakaway that was caught by the remnants of the field, and she again went off the front with a lap and a half to go when Kinley Gibson (The Cyclery) attacked. With both major teams in the break, there was no incentive to chase, and the pair quickly opened a 30 second gap. Coming into the final 200 metres, Maine jumped and easily took the title by a few bike lengths. Sara Bergen (Rally Cycling) won the sprint for third. 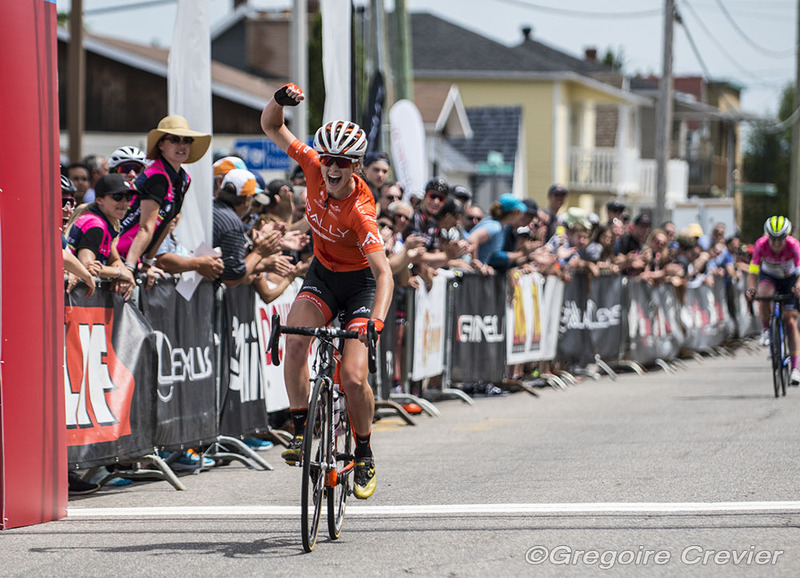 With her win, Maine became both the Elite and Under-23 Canadian champion. "Our plan was to race our bikes super hard and take advantage of the opportunities that presented themself," said Maine. "Kinley [Gibson] attacked and I sat on her wheel. She rode the most incredible lap and I could feel my legs start to cramp. When she started to go, I knew that I had to go for it. I can't believe this happened!" The men's race included European-based pros Duchesne, Svein Tuft (Michelton Scott) and Ben Perry (Israel Cycling Academy), plus strong North American teams Silber Pro Cycling and Rally Cycling. Duchesne and Perry were part of an early move that split the field in the chase. The front of the race saw multiple riders join and get dropped, with only Duchesne and Perry consistently there. Both Perry and Tuft suffered mechanicals early in the race and had to chase back up. 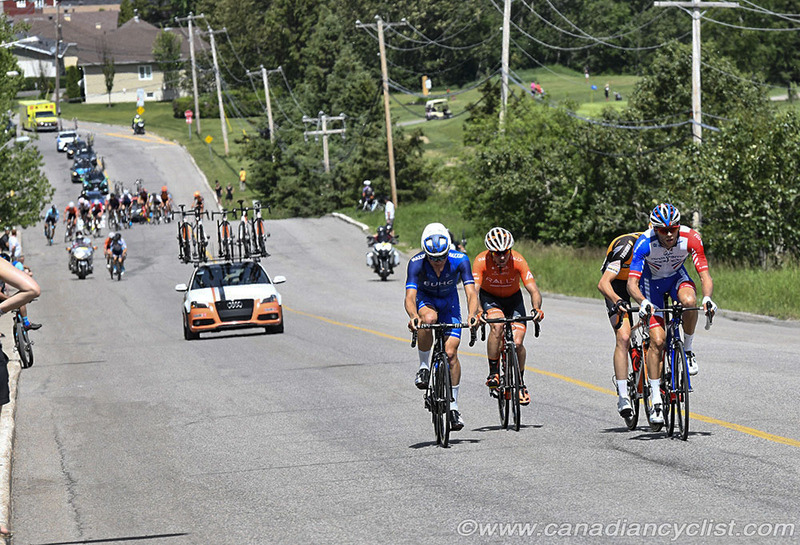 With the race down to less than 30 riders from 128 starters, Duchesne, Perry and Nigel Ellsay (Rally Cycling) finally broke clear of the chasers with less than 40 kilometres remaining. In the sprint, Duchesne went to the front early and held off Perry for the win, with Ellsay taking third. Edward Walsh (T-Palm PCW) was the Under-23 champion, finishing tenth overall. "I really believed it this time; I felt really strong coming out of Dauphine," said Duchesne. "I felt confident, but stressed and nervous, since I knew I could win it. I tried to put myself at the front so I wouldn't have to worry about chasing stuff down. I was in every move all day long and still managed to have a little left for the sprint."